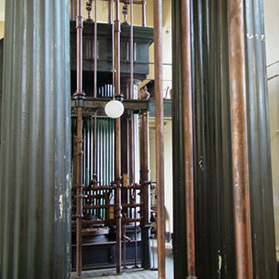 The 100 inch engine is the largest surviving single cylinder beam engine in the world. Built by Harvey & Co of Hayle in 1869, it first pumped water in 1871. It was one of only six engines of this size built in Cornwall, five of them being built by Harvey & Co. At one time 70% of London’s water was pumped by Harvey engines and the company maintained an office at Nine Elms. When running the engine was synchronised with the 90 inch engine so they stroked alternately. The engine ran for most of its working life with a cracked beam and the crack and its repair can still be seen today.